Is there any option to translate form data to English if it was sent in a language other than English? How does the email submission come in? If in the language submitted, can we translate back to english? If someone chooses a language other than English, you will receive the notification email in English if that is the language the form was originally created. 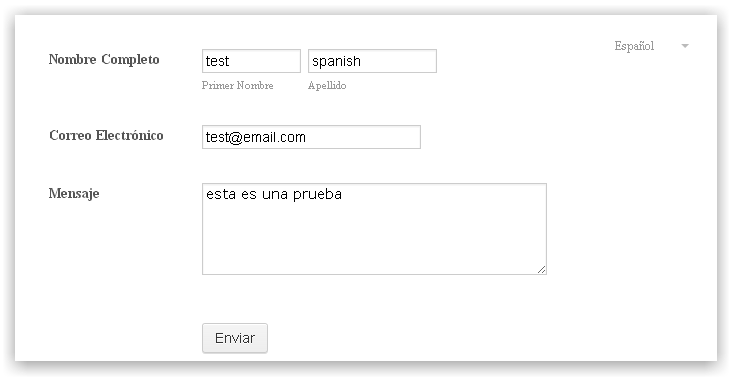 But the message that the user typed in the "Message" field comes in as Spanish. We like the ability to do this, but we would need to have someone here who could translate the "message" field back to English. You are right the, the informtion sent by the form user will be received in the language that it was original submitted. So, it would need to be translated using an external tool. However, I think it would be nice if our Languages feature has this capability, so, I have submitted your request to our dev team so that they can consider the implementation of this feature. We cannot promise you anything about this implementation as our team will consider if this is something feasible or not. In any case, you will get the notification via this thread if this is possible or not. Kindly open a new thread if you need help with something else. This would be a wonderful service if you could offer it! Hello. We are a norwegiam condominium in Oslo with many residents from both Norway and abroad. We made several forms in english and translated them to norwegian, but we get all the forms back in english. This means that after we get the forms back, we are unable to identify the users who adress us in norwegian, and those who only speak english. Ideally, it would be great if in the future, the form that we receive is in the same language used by the person who sends it. We're glad to see that you love JotForm. Hi...We are in the same situation in where we have a form that is in Chinese but the person who receives the submitted forms only speaks English. I see above that you were possibly going to create a translation component that would translate the message submitted in Chinese into English so it could be read. Please let me know if there has been any progress on this feature and if so, how do I do it? @hrcfertility: I've moved your inquiry into a new thread. Please find it here (https://www.jotform.com/answers/837919).